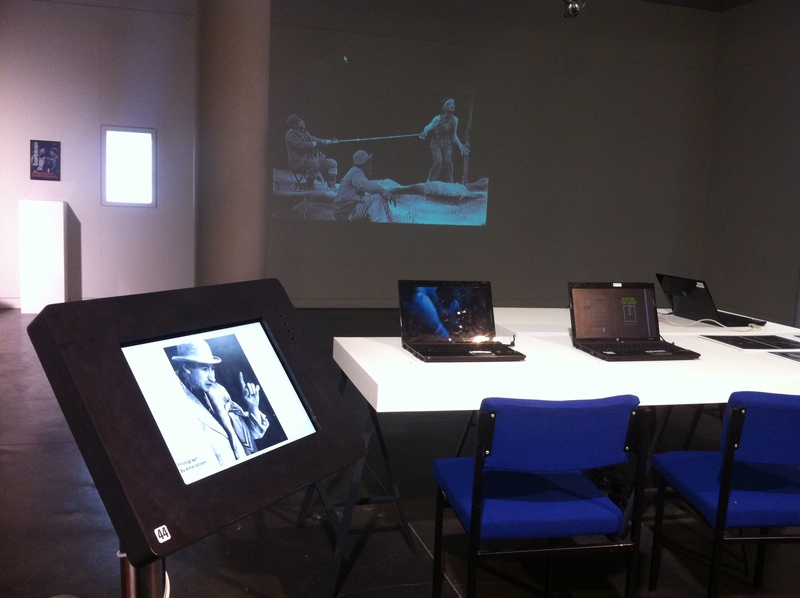 Following its positive reception at our April Conference, the Staging Beckett exhibition, Waiting for Godot at 60: An Exhibition, is currently on tour in Enniskillen, Northern Ireland, for the duration of the Happy Days Enniskillen International Beckett Festival. 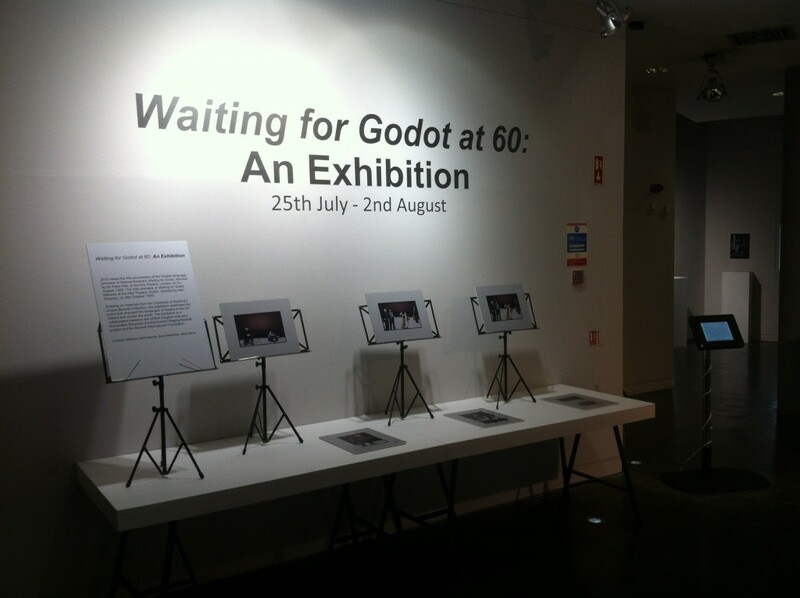 The exhibition contains materials relating to a wide range of productions of Waiting for Godot staged across the UK, Ireland and international platforms. 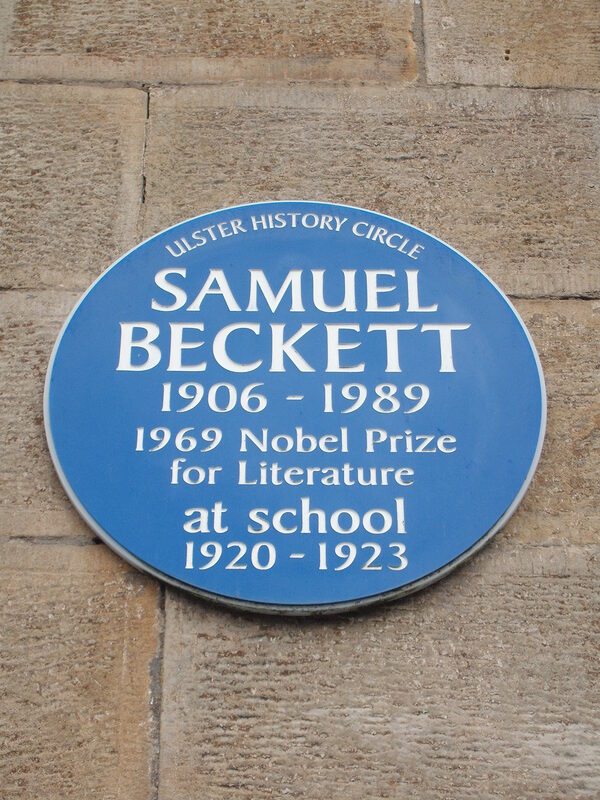 These include productions such as premieres of Godot in Paris (Théâtre de Babylone, 1953), Berlin (Schlosspark, 1953), London (Arts, 1955) and Dublin (Pike, 1955), as well as later productions at the Nottingham Playhouse with Peter O’Toole (in 1971), the Gate Theatre in Dublin (from 1988-2008) directed by Walter Asmus, and more recent performances such as the Theatre Royal Haymarket (in 2009). In what we believe may be an Irish premiere, Samuel Beckett’s Production Notebook 2 and Warten auf Godot text for his 1975 Schiller Theater Berlin performance are also on display. 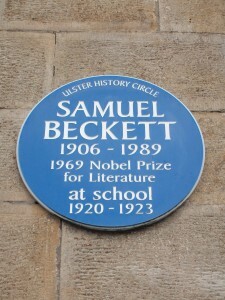 Furthermore, the exhibition links itself to Beckett’s connections with Enniskillen, as it contains programmes and reviews for performances of Waiting for Godot at Portora Royal School – the school Beckett attended from 1920-1923. 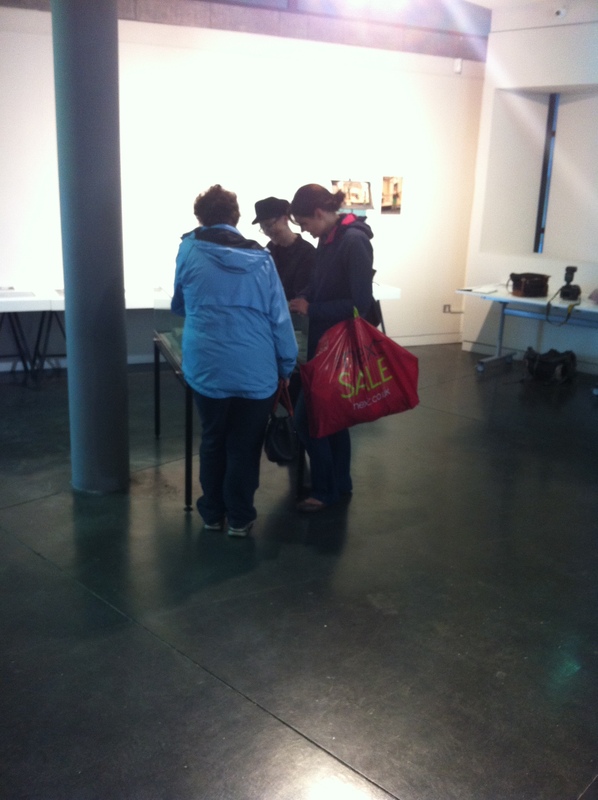 Professor Anna McMullan guiding some visitors around Waiting for Godot at 60 during its opening at the Higher Bridges Gallery in the Clinton Centre, Enniskillen. Waiting for Godot at 60: An Exhibition coincides with the Festival’s programming of the Berliner Ensemble’s performances of Warten auf Godot directed by George Tabori and the 60th year anniversary of the British and English language premiere of Waiting for Godot at the Arts Theatre in London, which was performed on 3rd August 1955. We appreciate the support of Guy Baxter, Sarah McHugh and the Happy Days Festival team for making this exhibition come to fruition. We are also grateful to the Beckett International Foundation, the Victoria and Albert Museum (particularly for their permission to use photographs of productions held in their Houston Rodgers and Douglas Jeffrey Collections) and to the Arts and Humanities Research Council for their continued support. Waiting for Godot at 60: An Exhibition is curated by Matthew McFrederick, Anna McMullan and Mark Nixon. The Exhibition is open from 10am to 6pm until 2nd August at the Higher Bridges Gallery in the Clinton Centre, Enniskillen and is free.